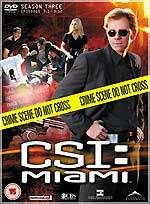 Momentum Pictures will release the first half of the third season of CSI: Miami on DVD on May the 29th. The three-disc set will feature the first twelve episodes of the series. Five of them will have commentary tracks: Lost Son (by Elizabeth Devine), Under the Influence (by Corey Miller, Marc Dube and Scott Lautanen), Crime Wave (by Elizabeth Devine and Karen Gaviola), After the Fall (by Marc Dube, Scott Lautanen and Ildy Modrovich) and Shootout (by Corey Miller and Sunil Nayar). There'll also be at least one featurette, titled Visualising Season Three. Another, titled Deep Blue Sea (about filming in open water), may appear in this set. (The press release is unclear: it says "a featurette", but lists both). The set is thought to have an RRP of £39.99. Fabulous Films will release the quirky 1991-92 fantasy series Eerie, Indiana on DVD on July the 10th. The three-disc box set features nineteen half-hourish episodes of the show, which featured the adventures of a thirteen year-old boy who discovers that the town of Eerie is host to all sorts of paranormal events and characters. Episodes of the series were directed by Bob Balaban and Gremlins' Joe Dante (who was also the show's Creative Consultant). RRP for the set if £24.99. Our forthcoming releases database, Incoming, is regularly being update, with new titles, new information, and new retailer links and offers. To find out what's due in the next few weeks click here. We also retain Incoming data for several weeks. You can find a list of titles that came out in the last four weeks here. Please continue use the affiliated retailer links to support Zeta Minor! Paramount will release the indifferently-received science-fiction action movie Aeon Flux on May the 22nd. The film stars Charlize Theron as the eponymous secret agent / assassin, who made her debut in an animated MTV series. The film will be supported with more than four hours of bonus material, including two commentary tracks (one with Theron and producer Gail Anne Hurd; and a second with writers Phil Hay and Matt Manfredi); various featurettes (Creating a World; The Locations of...; The Stunts of...; The Costume Design Workshop of... and The Craft of the Set Photographer...); and a theatrical trailer. The film will be presented in anamorphic widescreen format, with Dolby Digital 5.1 audio, and optional English subtitles. The RRP is £19.99. The featurette about the set photographer should be interesting. It's something of a dying art, and many a good film has been let down by simply horrible on-set photography (most of John Carpenter's films, for example). It must be tempting to scrimp on hiring a good photographer, but using some hack snapper is guaranteed to harm your movie in the long term (just think of all the terrible Photoshop composite DVD sleeves you've seen: the chances are that the designers don't have good images to work from). The quality of promotional photographs from a film can tell me a lot about the quality of the production. Great photography can create enormous anticipation for a project (remember the first photo from Gladiator - the one of Maximus, Tiger and the tiger in the arena?) For a current example, look at the photo's coming out of Mel Gibson's Apocalypto - simply stunning! 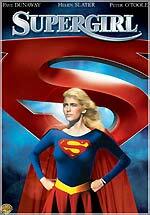 Warner Home Video will be shamelessly cashing in on the theatrical release of Superman Returns by releasing a bare-bones disc of Jeannot Szwarc's Supergirl on June the 26th. The UK disc is missing all of the bonus features that were on Anchor Bay's US release (a commentary track, featurette, trailers, etc). WHV is quoting a running time of "119m", so it's unlikely to be the 138m Director's Cut version that was offered as part of Anchor Bay's Limited Edition disc set. No technical specifications were announced. The RRP is £12.99. Tartan will release two early Bergman films, Music in Darkness and Prison, on June the 26th. Both films will be Region 0 titles, with anamorphic widescreen transfers, and Dolby Digital 2.0 audio. Both discs will be supplemented by a trailer, filmographies, and notes by Philip Strick. RRP will be £19.99 each. Menu screens for Tartan's forthcoming Flesh For Frankenstein and Blood For Dracula DVDs can be found here. Contrary to information provided by the press release, Flesh For Frankenstein is in 2.31:1 ratio, and Blood For Dracula is in 1.83:1 ratio (both with anamorphic enhancement). Revelation will release the third season of The Tribe on May the 22nd. The seven-disc set will feature fifty-two episodes, and will have an RRP of £34.99. The DVD release of Bryan Singer and Dean Devlin's science fiction mini-series The Triangle has been re-scheduled for May the 29th. The series will air on BBC1 on May the 27th, 28th and 29th. Menu screens for this two-disc set can be seen here. 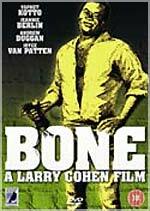 Anchor Bay UK will release Larry Cohen's provocative 1972 thriller Bone on June the 19th. The film, which stars Alien's Yaphet Kotto as a criminal who invades the lives of a wealthy white couple living in Beverly Hills, is presented in 1.84:1 anamorphic widescreen format, with Anchor Bay's usual choice of Dolby Digital and DTS 5.1 audio tracks. The film is supported by a commentary track (by writer / director Cohen); a featurette on prolific producer Jack H Harris (8m); a featurette titled Unreal, which presents half an hour of footage from the aborted original version of the film (which features a different lead actress); trailers; radio spots; posters and stills galleries; and a Larry Cohen filmography. The RRP is £16.99. 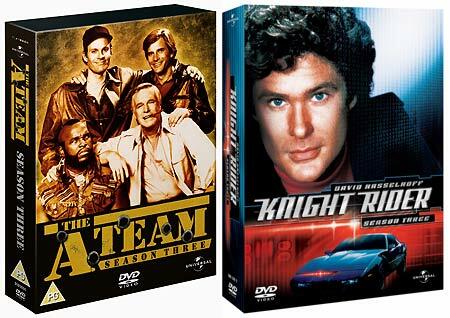 Universal Playback will release the third season of The A-Team on May the 22nd. The six-disc set will feature twenty-five episodes, and has an RRP of £34.99. May the 22nd also sees Universal Playback releasing the third season of Knight Rider. The six-disc set will feature twenty-one episodes, and has an RRP of £34.99.